REVELL'S NEW 1:72 SCALE KIT DEPICTS the mobile transporter for the SS-25 intercontinental ballistic missile. A single SS-25 is carried inside a long cylindrical housing. Mat Irvine: If this kit looks familiar, it should do as it originates from Zvezda, which has already been reviewed in Scale Model News. However, Revell Germany’s kit is packaged differently, and gives the builder more options. The kit consists of the TEL (Transporter-Erector-Launcher) vehicle, which carries the SS-25 missile in its launch container. You do not get the actual missile with this kit, instead it’s the cylindrical container. The box back (below) has detailed photo reference of the finished kit, useful when you come to build it. There is also a small parts layout pic. A note re classifications. SS-25 is the NATO designation of the missile - surface-to-surface. The codenames for this type of missile all start with the letter S, in this case Sickle. 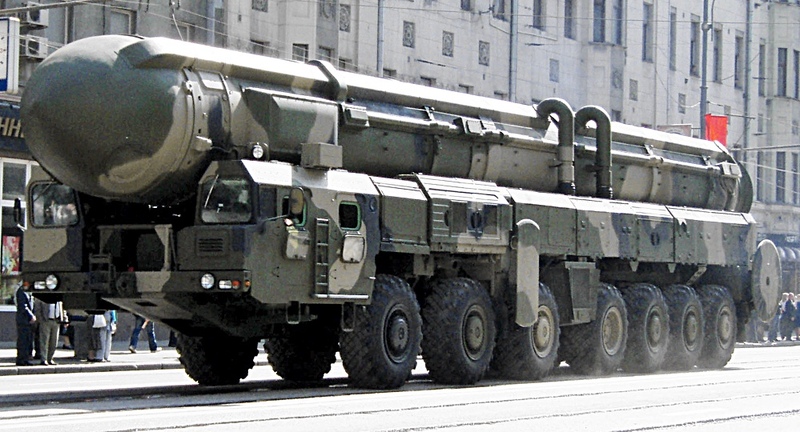 The Topol designation is the official Russian name for the missile. Assembly follows the same procedure as the Zvezda original. Although it is ‘only’ 1:72 scale, the TEL is a very complex kit, and not really one for the inexperienced. Revell lists it at the most difficult Skill Level 5. Revell Germany has moved to producing instruction leaflets in full colour, a big improvement. Despite its complex nature, the kit goes together in a straightforward manner, so long as you follow the instructions. You can build the model in either travelling mode, with support feet and launch control unit retracted, or in stationary firing position, with feet lowered, the missile arm horizontal, or raised for launching. An example (below) of the clear and comprehensive TEL instruction pages. Colour illustrations (below) give details for optional military marking schemes. Colour scheme for the civilian launcher (below) and supplied decal sheet. The main difference between Zvezda and Revell kits is that, besides two military options, Revell also supplies the version used to launch commercial satellites under the START Project. The slight problem here is that while Revell supplies a very nice set of decals for this version, technically the civilian launch rocket’s upper stages are somewhat different. Not substantially so, but at 1:72 scale they make it about 10 mm (0.4 in) longer than the military ICBM. Some other details are different, too. In fact, LVM Studios of the Netherlands supply a conversion kit (below in yellow) which can be used with the TEL. The kit missile tube (above, below) in military-finish olive drab. Next to it is the LVM Studios civilian conversion, painted yellow. TEL with launch tube (below) as built straight from the kit. Note the extended launch feet and raised wheels. The real thing, seen (below) in Moscow, 2008. Finished in military markings, this is an excellent kit. The civilian version looks pretty good with the bright yellow launcher, though if you are in the know, you can spot the errors. But otherwise this is a good reissue, with slightly more options than the Zvezda release. Click here to read SMN articles on the TEL kit, and click here for other Zvezda kits. SMN note: We think it’s a bit of a cheat not supplying an SS-25 missile, particularly as the box art (see header) clearly shows one lifting off. Adding a few more components to supply even a simplified SS-25 would mean that the entire raison d’etre for the TEL is included. And that would make all the difference.